Tying a brand to a big news story is a time-honored public relations tactic for earning media coverage. Sometimes it’s about a fast-breaking event, like a data security executive commenting on a major hack. Often there’s a narrow window of opportunity to ride the wave. Then there are stories that dominate over months, offering more time for planning and programming, like – well, the U.S. presidential election. Hitching a brand to politics is always tricky, and this election season has been a land mine for anything or anyone who doesn’t already have to be part of it. It’s been nasty, divisive, and occasionally NSFW. Definitely not a civics lesson for the kids. That’s why I was impressed with Excedrin’s clever hashtag campaign around the third and (thankfully) final presidential debate. #DebateHeadache popped into my Twitter feed at exactly the right moment last night, and it’s been trending all day. Unlike Bisquick’s bid to mix it up during the second presidential debate, the Excedrin campaign is a winner. The promoted tweet itself is blatantly commercial — something that rarely succeeds in engaging Twitter users. But it definitely hit a nerve. The tweet got more than 2,100 likes and 900 retweets in its first hours and generated lots of sympathetic new tweets that used the hashtag. It’s successful because it zeroes in on the pain points of many election-watchers, from pundits and media to us ordinary voters. And it includes a statistic from a brand-sponsored survey, another tried-and-true tactic for generating buzz. Not original, but the social packaging and clever timing makes it fresh and easy to swallow. And though it’s been hijacked by partisans on Twitter (always a risk for a hashtag campaign), the idea is universal enough that the brand is protected from the ugliest aspects of the election season. We can all agree on one thing, that it’s been a giant headache and we can’t wait for it to be over. 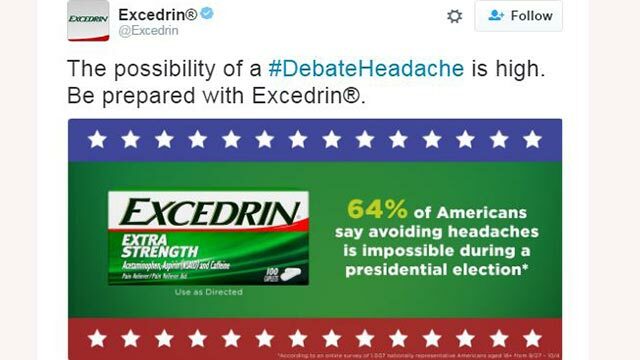 Excedrin’s debate prescription comes in contrast to the Bisquick hashtag campaign of ten days ago. #PancakesVsWaffles backfired, not only because it inserted the wholesome Bisquick brand into the social chatter about the second debate, but because it seemed to trivialize the real issues at stake. As Marijane wrote, it was the type of campaign that worked if the goal is press at any price, but it failed to generate the kind of organic response that makes a hashtag work. With its appeal to the masses and our long-suffering tolerance of things we can’t control, Excedrin’s is almost reminiscent of the old Alka-Seltzer ads of yore. Similar message, new package. So, bravo, Excedrin. A successful hashtag campaign may look easy, but it’s like a viral video – far harder and more unpredictable than you think. Can’t wait to see what’s in store for election night.